The shocking reality is that you can't build wealth this way because these tenets have absolutely nothing to do with wealth building. And if you believe that they do then you have been brainwashed to believe that income from a job equals wealth. It doesn't! You also have been brainwashed to believe that saving money from your paycheck and putting it into a bank that pays less than 1% interest and living below your means will allow you to create and build wealth. It won't! However, what will allow you to build wealth and allow you to build it fast is knowing and understanding the actual laws of wealth building and its associated principles then applying them. 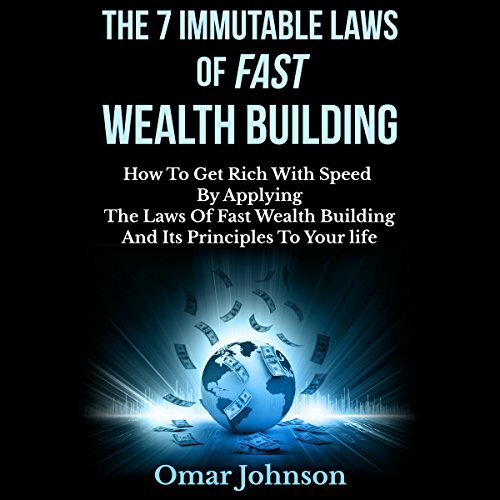 In his audiobook entitled The 7 Immutable Laws of Fast Wealth Building author and serial entrepreneur Omar Johnson gives you the information that is necessary for you to put together your plan for wealth creation, wealth multiplication, and wealth preservation, the three cornerstones of fast wealth building. I wish I could read this little book every day! In a word this was masterful! I learned so much and wish it could have gone on. Mr Johnson took the time to make these much needed lesson make since. I think I liked it so much because it made me look at both my motivation for wanting wealth and method for getting it in a different light. What did you love best about The 7 Immutable Laws of Fast Wealth Building? The view on it can be applied with "TO-DO"